« Funding a Wiltshire Orchard? Fruit blossom is appearing about three weeks later than last year due to the very cold weather throughout the month, but at last the fruit trees are coming into flower. We will follow their progress through the trees in the National Fruit Collection at Brogdale in Kent, courtesy of Mary Pennell who has kindly agreed to give us a weekly update. Last week with the lovely sunshine and warm temperatures things were finally moving on in the orchards. Bud development is looking to be at least 3 weeks later than the average this year due to the very cold and extended winter. The apricots are disappointing having very light and patchy blossom. It has made recording the flowering periods impossible as the growth stages ranged from white bud to petal fall within the same variety. 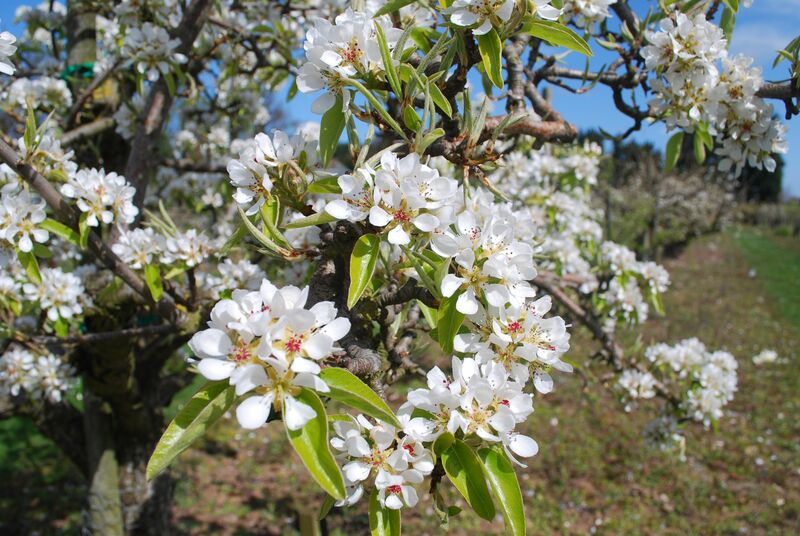 Some early plums were in flower last week – about 20 days later than last year – but 2013 is by no means the latest ever recorded at Brogdale certainly for plum blossom. One or two years in the early 1960s, mid 1970s and in particular 1986 were as late if not later. Most of the plums are now at full flower with the exception of the very early and very late varieties – many seem to have flowered at the same time this year. Most of the cherries have moved on since last week with some now at the white bud stage with a few flowers opening on some varieties. Many of the pears are at 10% open with a few coming up to full flower. Apples have advanced with most now at green cluster stage with a few at early pink bud. The warm sunny weather over the Bank Holiday weekend has helped to bring more blossom out especially the cherries which are virtually all at full flower now. However, the cooler wetter weather predicted for this week may hold things back again. Most plums have now gone over with the exception of some of the later varieties such as Marjorie’s Seedling. Most pears are at full flower with a few showing signs of going over. Apples are just starting to flower with several varieties at the pink bud stage or at 10% open. The blossom period is still generally 2 – 3 weeks later than 2012. The pears and plums have all gone over now and most cherries are heading towards 90% petal fall. Despite the cool wet weather at Brogdale over the past week, the apples continue to move on with many now at full flower. Quinces will probably be at 10% open by the end of this week. The apple blossom is now mostly going over – the cool unsettled weather over the last few weeks has meant that the apple flowers have been out for a reasonable period of time this year. The apple blossom has also been quite heavy so has generally looked very attractive. Because of the heavy blossom I have noticed that the number of seedlings along roadsides has been particularly evident this year. One of the last apples that we record, ‘Feuillemorte’, should be at 10% open by the end of the week. The quinces are coming up to petal fall and the medlars are just starting to flower. The cherries and pears all look to be setting well so we hope for a good crop maybe this year. There is concern that apple fruit size could be small this year partly as the season is running about two weeks later than last year and also because of the effect of the generally low temperatures we have been experiencing. I understand that the temperature over the next few weeks will be quite critical. The last apple – Feuillemorte)- that I record has just reached 90% petal fall on 16th June. The medlars have also now gone over. The fruit set on the apples looks very variable at the moment but cherries, plums and pears all look quite encouraging although it looks as though the cherries will be ripening a little later this year.